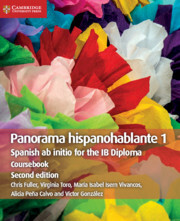 This coursebook helps students explore the new IB Diploma ab initio themes (first examination 2020): identities, experiences, human ingenuity, social organisation and sharing the planet. Designed for students with no previous background in Spanish, this coursebook develops well-rounded language skills and encourages learners to become open minded, international citizens – reflecting the mission of the International Baccalaureate. Authentic texts and vibrant images from around the world are specifically selected for older teenagers and to give them an insight into different cultures and viewpoints. 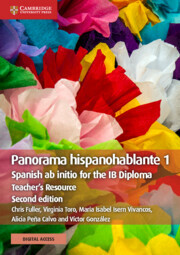 Answers to the coursebook activities and audio accompanying the listening exercises are in the teacher’s resource.